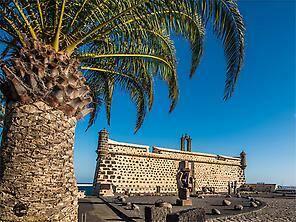 Arrecife, the capital of Lanzarote, is a quiet, beautiful port city situated on the eastern coast of the island. Sharing prominence in its urban layout are the streets of the historic centre, filled with shops, and popular neighbourhoods such as San Ginés. 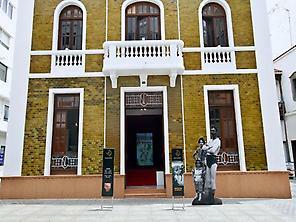 Not forgetting the many museums and historic buildings which permit Arrecife to enjoy an active cultural life. And in the seafront area, it provides attractive beaches and excellent nautical facilities along with the opportunity to play golf while taking in the striking views of the Atlantic. The development of Arrecife as a city is closely linked to its port and commercial strength, which allowed it to attract political and economic power until, in 1847, it became the capital of the island to the detriment of Teguise. The city grew around San Ginés, a historic fishing centre established on the shore. Amid its streets steeped in the local seafaring atmosphere is the church of San Ginés. Standing on the site of the first hermitage to be constructed in the capital, it was rebuilt in the 17th century, while its slender belltower dates from the 19th century. Arrecife has outstanding examples of defensive architecture. On a small island in front of the historic quarter stands the castle of San Gabriel, which was built in the 16th century as a defence against continuous pirate attacks. Declared to be a National Monument along with the Bolas bridge, it currently houses an astronomic observatory. Not far away is the castle of San José, built in the middle of Naos bay by King Carlos III. Its facilities play host to the International Museum of Contemporaty Art (MIAC), which contains a valuable collection of work from the 20th century by artists of the stature of Picasso, Miró, Chillida or Tàpies. It is worth a look through the streets of Arrecife to find its significant buildings, such as the “Agustín de la Hoz” Municipal Arts Centre a nobleman's mansion from the mid-19th century and Casa de Los Arroyo, an old house converted into a Science and Arts Centre. The coast A long promenade runs along the coast of Arrecife. The island's volcanic origins provide a considerable diversity of nature, especially among its reefs, as well as a great many colonies of seabirds which nest in the area. One of the most emblematic images of the city is provided by Reducto Beach, sheltered by the Punta del Camello headland and the small island of Fermina. Visitors who prefer water sports can make use of any of the city's excellent nautical facilities, where there is a variety of options available, such as windsurfing or sailing. Golf lovers, meanwhile, have access to an 18-hole course immersed in an exotic volcanic setting situated on the outskirts of the city. Here players of all levels can enjoy the sport while taking in the exceptional views of the Atlantic. 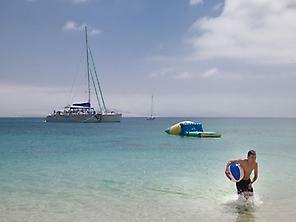 Gastronomy and surroundings Arrecife is a genuine showcase of the gastronomy of Lanzarote. Outstanding are the fish specialities, particularly “vieja”, which is either stewed or opened and roasted on the grill. Not forgetting "sancocho" stew, the fresh seafood and the most well-known dish from the Canaries, "papas arrugadas" (boiled potatoes), which are usually served along with "mojos" (traditional sauces). Cheese, fresh or cured, forms part of the local tradition. The best accompaniment for these delights will always be one of the wines with the Designation of Origin Lanzarote guarantee, among which the aromatic Malvasías are outstanding. The strategic position of the capital means it is quick and easy to reach from any point on Lanzarote. At the northern end of the island is Haría, a small urban centre set among the hills of a fertile valley. In its coastal area we can find Cueva de los Verdes, as well as Jameos del Agua and the Mirador del Río viewpoint, these latter ones the work of Lanzarote-born architect César Manrique. Very close by is Teguise. The former capital of the island of Lanzarote possesses a significant heritage of buildings in its historic quarter, which gathers together beautiful examples of popular and noble architecture. The mark of Manrique is present in Teguise through the Cactus Garden and the foundation which bears his name, which was also the artist's former residence. To the south are towns such as San Bartolomé, with the outstanding Casa del Mayor Guerra and Casa Ajei; Tinajo, in whose sanctuary of Mancha Blanca the island's patron, the Virgen de los Dolores, is venerated; or Yaiza, a town located in a volcanic surroundings which form landscapes of matchless beauty, such as El Golfo or Los Hervideros. All this is complemented by Lanzarote's coastline, sprinkled with beautiful beaches and major tourist centres, such as Costa Teguise, Playa Blanca or Puerto del Carmen. But the greatest centre of tourist attention is, without a doubt, the Timanfaya National Park, a true showcse of the island's volcanic ecosystem. The visit includes a bus trip which covers the Route of the Volcanoes and whose starting point is the visitors' centre. The park is in turn surrounded by the Volcanoes Nature Reserve, where fields of ash and lava run down to the sea. 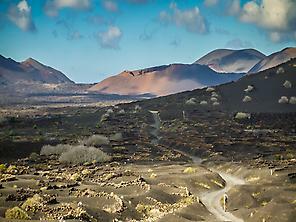 Lanzarote, hiking and relax, one week.